Spencer is at Harvard to play basketball and hopefully get into med school. Spencer is a really good character. From the wrong side of Chicago to the Ivy Leagued and wealthy Harvard, he seems to fit in just fine. Spencer was raised by a single mother and never knew his father. But his father left money for his education and somehow this is all connected to a very old final club, The Gas. At the Delphic House rumors abound concerning a secret room and several deaths. 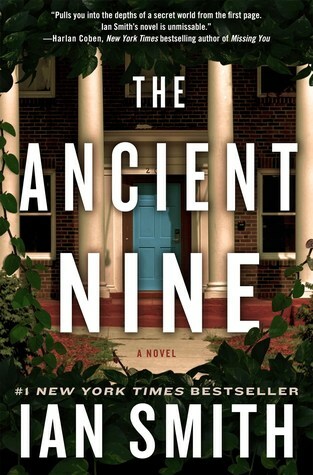 When Spencer’s friend Dalton steals a book from his dying Uncle, the two of them set out to find out the truth behind the disappearance of a student and who are the Ancient Nine? A secret society, a hidden secret from King James I, and throw in some Nazi’s and you have yourself an unstoppable mystery with thrills around every corner. From the very first page you know this is going to be one of those you can’t put down. It’s got a little bit of everything in there and I found myself actually heading to the catalogs to verify some of the historical portions. Very interesting. I can’t wait for the next one!